Even by its own lofty standards, the Bose® Home Speaker™ 500 is fantastic. 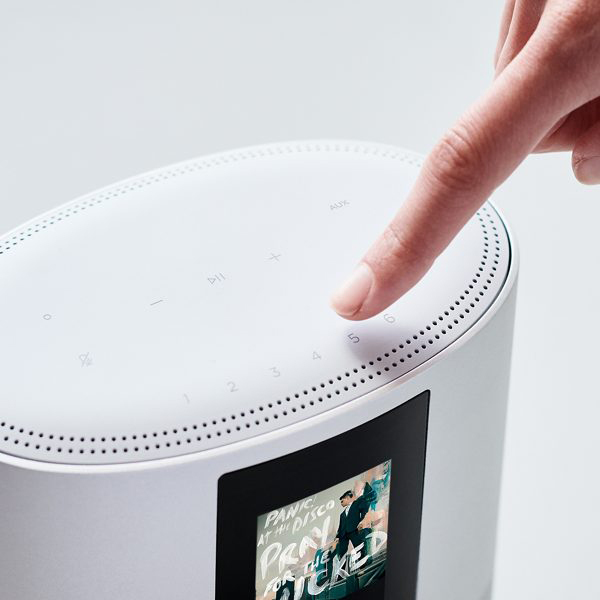 The setup, soundstage, and digital assistant support rank as high or higher than the other leading smart speakers. Combine that with stunning looks and arguably the most user-friendly app on the market, and it’s fair to judge the Bose Home Speaker 500 as the best overall smart speaker available today. Device setup isn’t always the most the exciting thing to talk about, but it’s worth mentioning if for no other reason than because the Bose Home Speaker 500 makes it so easy. Download the free companion app, power it on, and pair—that’s it. 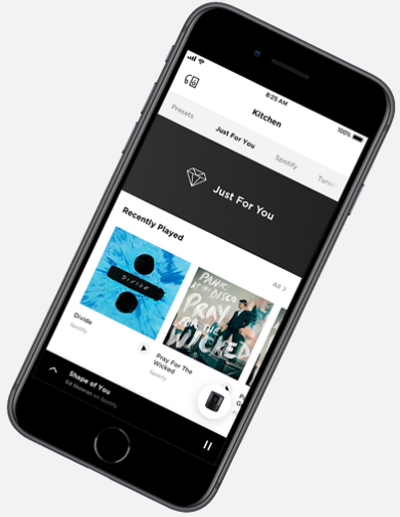 The app lets you access all your music from one spot, making it easy to jump between streaming services and libraries. You can also use it to personalize playback and set up different listening profiles. 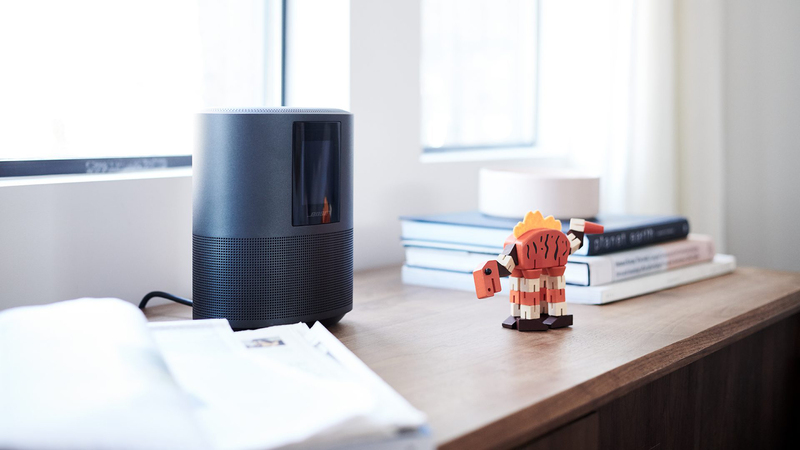 But for users who just want to unbox and rock, you can connect via Bluetooth or Wi-Fi and start streaming music in less than a minute—a welcome change from other devices that require a more laborious setup. When talking about design, you must consider the build quality and aesthetics. For the Bose Home Speaker 500, the build is objectively great. Its seamless anodized-aluminum body measures roughly 8 x 7" and weighs close to 5 pounds, giving it a feel that is sturdy and substantial, but not cumbersome. The color LCD screen is also very high quality—album artwork looks great and track info is easy to read. Your touch controls and preset buttons are located on the top and the aux and power ports are inconspicuously placed on the back and bottom. In short, a very clean, efficient design that’s neither too busy nor lacking in any areas. 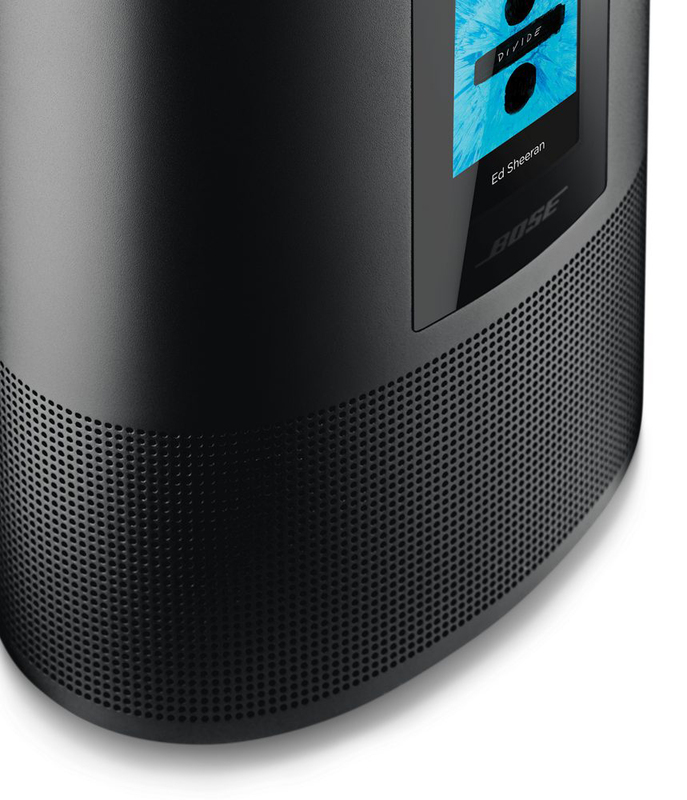 Now, in terms of aesthetics, I prefer a cylindrical design, so the Bose Home Speaker 500 is right up my alley. I like how it looks even more than my previous favorite, the Apple HomePod. The difference is the screen, on which I wasn’t completely sold at first. But after a week of having the Home in my apartment, seeing how sharp the album art looked on the LCD screen and how well the speaker fit in with the other furniture in my apartment, I really fell in love with it. It is hands-down my favorite design. Most people will agree that the name Bose® is synonymous with extraordinary audio quality, so it’s no surprise to find out the Bose Home Speaker 500 sounds great. Having tested or used all of the major smart speakers on the market, I feel comfortable ranking the Bose Home Speaker 500 second behind only the Google Home Max in terms of total sound—and even that is more of a situational use case. For comparison, I would say the Home sounds as good as the Apple HomePod, which is to say: fantastic. You get very clean wall-to-wall sound and and deep, super-rich bass that doesn’t distort or break up even at maximum volume. Bose is somewhat notorious for not sharing a ton of specs, but we do know that the Bose Home Speaker 500 uses dual opposing drivers to produce its big, room-filling sound. Whatever other sorcery the company has got going underneath the Home’s hood remains a mystery, but the result is sound quality that is at the top of the class. Rating just how “smart” a smart speaker is really has more to do with the built-in assistant than the speaker itself (although, the internal mic array does play a part). The Bose Home Speaker 500 comes with Alexa, so you get what I would argue is the most capable of all the digital assistants. With Alexa, you can control playback, get news and weather reports, check sports scores, control other smart devices, and so much more—all just with the sound of your voice. 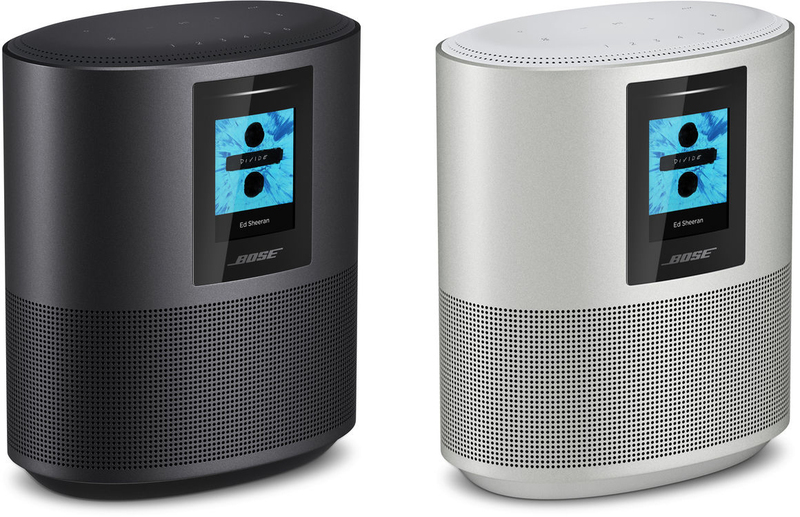 What the Bose Home Speaker 500 does to ensure Alexa works perfectly is utilize eight built-in microphones to pick up your voice. To put those mics to the test, I ran the same test I do with every smart speaker I try: I turn on the TV and stand about 30' away from the speaker and talk to it. The Home picked up my voice almost every time, even when I was speaking at a normal volume. 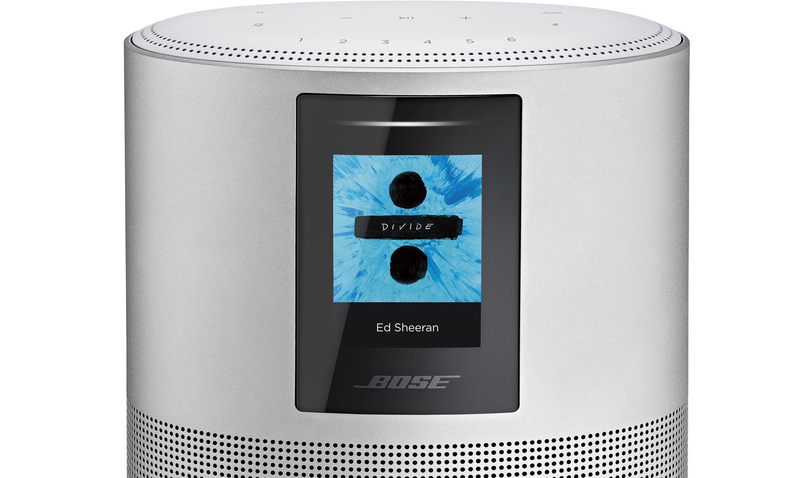 I rank the three top smart speakers currently on the market as the Apple HomePod, the Google Home Max, and now, the Bose Home Speaker 500. The line between those three is a little murky—each has a set of strengths that differentiates it from the others, making it difficult to label one as “the absolute best.” But, ultimately, what helped me decide was that, of those three, the Home is the only one without a discernible weakness, which is why I would vote for it as the top all-around smart speaker. It has the best setup and interface, a top-tier digital assistant and, in my opinion, it has the sharpest-looking design. In terms of sound, there are situations where I would give the edge to the Google Home Max but, in most cases, I would still opt for the Bose. If you’re looking for a smart speaker that is all strengths, no weaknesses, there’s only one option: the Bose Home Speaker 500. Questions about the Bose Home Speaker 500 or any other smart speaker? Drop us a line in the Comments section, below. Dennis C. on JR Martin: What is Photography?